I went to Lisbon to record a band called More Republica Masonica. The album turned out great, but the studio pictures didn't. However, I got these other photos courtesy of my host and tourism guide, DJ Nuno Calado. I know these look almost like postcards, but I took 'em all myself. 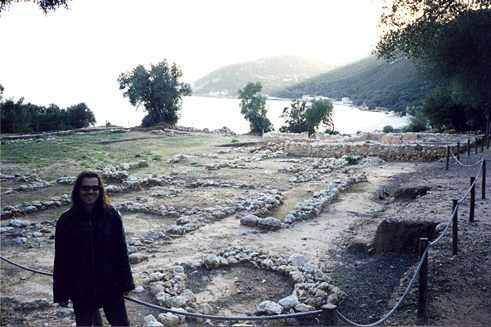 Roman ruins on the coast. There's Nuno. 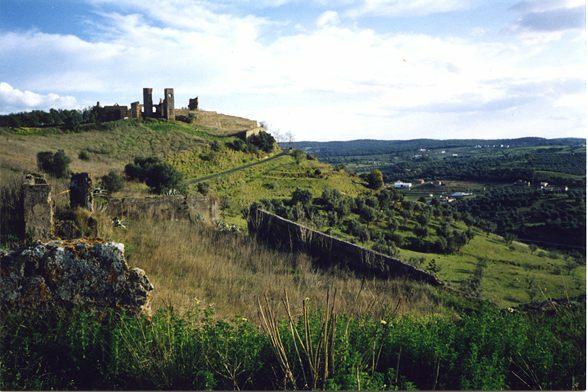 A ruined castle in Montemor-o-Novo. Lots of these in Portugal. 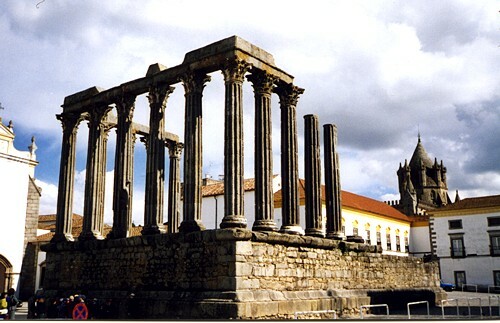 More Roman ruins: The "Temple of Diana" in the square in the small inland town of Evora. This is real. 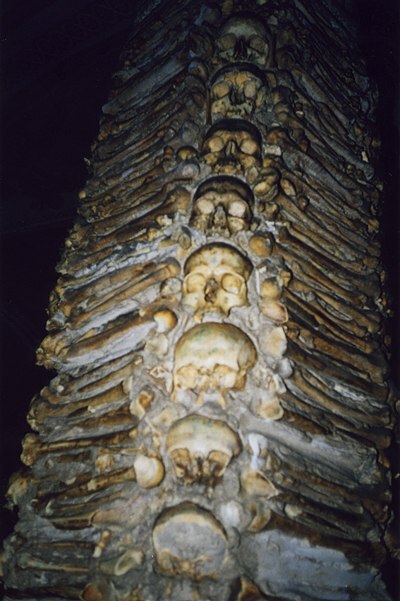 In the basement of a cathedral in Evora is a room called Capela Dos Ossos, or "Chapel of the Bones". 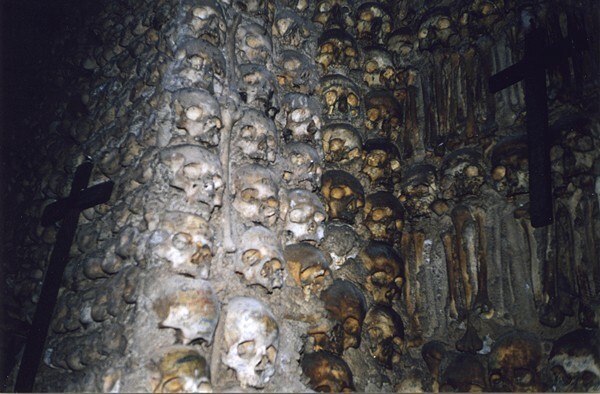 It's an honest-to-god room where the walls and columns are made of human skulls and leg bones. The history has been lost; all that is known is that they date back to the Dark Ages. Whose bones ended up here? No one is sure... plague victims, Inquisition victims, vanquished Moors? I've sure never seen anything like it. 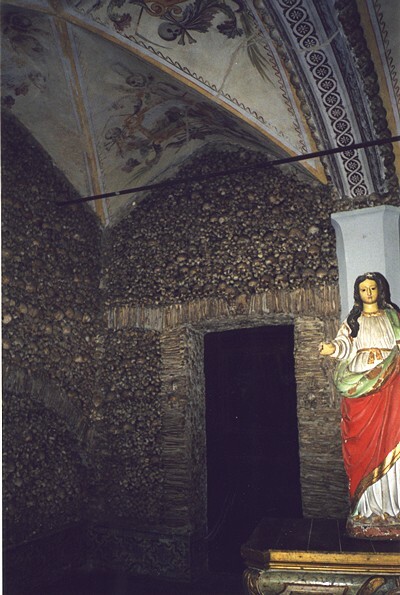 Apparently there are other old "bone chapels" like this in Italy and even the Czech Republic, I'm told... The paintings on the ceiling are full of angels and skeletons. Creepy indeed. Note the crosses (dimly lit) at left and right.